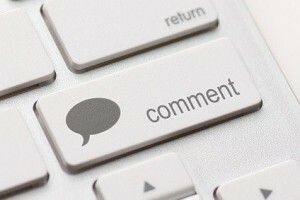 Comments on blogs are often seen as a measure of the value of the content. When we see lots of comments we might think that the article is really interesting because it has attracted so much attention. Of course, many comments are not true comments – but merely added by “bots” which are mainly designed to add links to other websites. I looked at a blog post the other day and there were 135 comments on it, but as far as I could tell only one was real. Several others were from the blogger himself, replying to comments. The other comments were clearly from bots saying things like, “I’m glad I saw this post; great stuff” and then a link to an often dodgy website. Most bloggers – myself included – switch off the ability for bots to add comments. It means that my blog – and others who do this – only occasionally attract comments. Some people suggest that this means people do not like the blog. After all, they argue, if the blog was any good people would comment. That’s an assumption, of course. Why would people comment if the blog post answers all their questions or is accurate and correct? In those circumstances there is nothing to add. In theory, therefore, a really good blog might never attract comments. New research puts this all into perspective. In an international and cross cultural study of comments, researchers found that there is a “herding” effect. We do what other people do. So, if someone posts a positive comment to a blog post we feel encouraged to also add a positive comment. However, if someone posts a negative comment to a blog, we tend to want to provide some kind of balance to that; our herding instinct is to get to some kind of “norm”. What this study showed was that a blog post with an initial positive comment receives further positive comments – thereby not really telling us as readers anything additional. If, though, the blog post gets an initial negative comment, other commenters try to balance that out, leading to comments which, overall are neutral – thereby not providing anything extra either. In other words, comments do not appear to add much value to a blog post after all. Any comments on that? On my blog, I’ve seen the drop off in comments or ability to generate comments (even though my traffic has risen) in the last 18 months or so and would tend to agree that comments are becoming less important. I’ve also noticed that comments don’t seem to make much difference to new clients when I get a call from them on the back of something(s) that I have written. Writing to generate comments, therefore, seems to be losing it’s value. I agree, Adrian; whether or not people have commented on what I have written appears to have little relevance to my customers. They are interested in what I say, not what people say about what I say…! Sage words as ever Graham. One of the reasons I enjoy them is that they either provide me with new insights or confirm my own experiences are not unusual. Readership of my blog has been trending upwardwards over the last few years. I block all spambot comments, and I do get more real comments now than I did a few years back. But rarely more than 2 or 3 per blog post. I’m now upto about 25,000+ visits a month. It’s a focused blog for an audience of accountants. They aren’t the easiest of people to engage anyway!